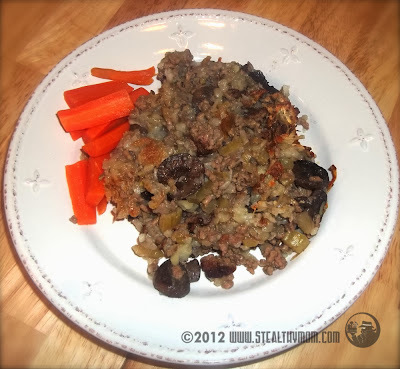 This is the natural version of the classic and simple, meat-and-potatoes dish. Unlike school lunches and bachelor pad vittles, this recipe contains no suspicious "ground beef," MSG-rich canned soup, or sodium-overload frozen potatoes. Pure, grassfed beef, fresh mushrooms, celery, onions and potatoes taste so much better! Guess what? It takes no more time to prepare than the original! Preheat the oven to 350F; grease a baking dish with butter or coconut oil. Dice the onion, slice the mushrooms, and finely chop the celery. In a wee bit of olive oil, sauté the veggies until they are soft. Add the grassfed beef and cook until browned. Meanwhile, grate the potatoes, peel and all. Layer half of the grated potatoes in the bottom of the baking dish, mix a quarter in with the beef and veggie mixture, and save a quarter for the top. Sprinkle 1/2 tsp salt over the potatoes layer in the baking dish. Spoon the mixture from the sautee pan over the potatoes in the dish. Cover with remaining potatoes and sprinkle 1/2 tsp salt over all. Pour 2 cups of water over the top layer. Bake for about an hour, uncovered. * If you can not buy grassfed beef where you are, tenaciously pester your butcher. Meanwhile, ground chuck will have to do. Grocery store "ground beef," especially in the mystery roll, will not work. Trust me. A key to reducing sodium in any dish is to start with ingredients that taste good and require no cover-up. I shared this recipe at Monday Mania and Traditional Tuesdays, round ups of "real" food recipes.